Born poor in Scotland, Carnegie immigrated to the United States in 1848, went to work at 12 as a bobbin boy in a cotton factory, then became a messenger in a telegraph office two years later. He worked his way up to private secretary and personal telegrapher for the superintendent of the Pennsylvania Railroad Company in 1853. Within a very few years, he rose to superintendent of the railroad’s Pittsburgh Division. 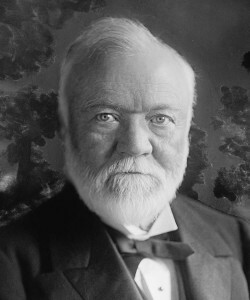 Through shrewd investment he came to control what became the Carnegie Steel Company, which he sold to United States Steel for $250,000,000 in 1901. Arguing that it was the duty of the wealthy to improve society, Carnegie used his enormous wealth to endow educational and other foundations, including a program to build and stock libraries in cities and towns across America.